I wanted to gel with the thunderbolts forum peeps to check what the general current view is on star birth. Wal has been pointing things out in recent space news episodes and there are confusing (different) ideas on what exactly happens during star birth. I propose that in a z-pinch, or star forming filament, only 1 star is born (per pinch). 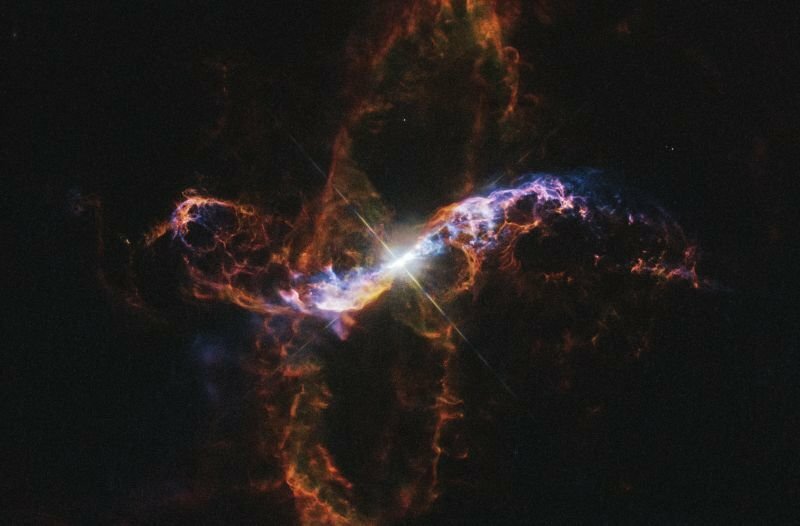 But when astronomers observe (as Wal also pointed out) a birth they see usually 2 stars, an archetypical example is R Aquarii*, where mainstream proposes a red giant and white dwarf, the white dwarf feeding on the red giant. I have no idea why/how they arrive at such a concept, that view looks nothing like the actual observation. in EU the pinch is 2 umbrella's (as Don Scott said), the classic hour glass shape, all star births have this shape (every planetay nebula so far observed is probably a star birth), the larger structure is the star forming filament, the pinch is embedded in this larger filament. With EU we see 2 plasmoids swirling around each other, the magnetic pinch (imho) should produce 1 star when the pinch subsides, but Wal says that 2 stars could form, or 1 star and 1 planet, i think Wal also said , 1 star (or more) in parts of the filament and along the filament also planets if not enough material for a star. Any other ideas? is actually electric fields. That is because mainstream does not consider electric fields at all. And with electric fields, we have a much easier physical model. We already start with a separated charges. Charges can cause attraction inside dusts and gas. This way we get clusters of matter. And if separate charges discharge, we get an electric current. The electric current creates magnetic fields. Magnetic fields attracts paramagnetic matter (like oxygen) and ferromagnetic matter (iron). The currents cause matter to flow in a small channel through space. The currents also cause ionisation and double layers. The currents follow ions and conductive matter that is already there. This increases the concentration of matter even more. The concentration of matter causes all kinds of chemical reactions. Iron oxidizes. Oxygen with hydrogen forms water. likely go just around the matter. This again increases the concentration. This can sometimes happen in oscillating systems. With water or carbon-dioxide we get clouds and ice. When there is enough matter, the gravity will start to become more important. This causes more matter to concentrate together. Due to the electromagnetism, this will form disks and rings. and this cycle can start again. Now we have a star. When a current initiates a nuclear reaction, we get charge separation. The star/gas-blob starts to eject charged matter. This creates its own current. Due to the already present magnetic field, this is into 2 directions. That is because the currents try to avoid any magnetic field. So it stays close together with the currents that are already present. Currents cause more magnetic fields and new nuclear reactions. can no longer eject charged particles into only one direction. Now the star starts to eject charged particles into all directions. Start nuclear reaction using a current. Test how the nuclear energy is converted into electric energy. 11. Make your own fusion reactor. Thanks for all of that, yes you describe some of the phases where during the formation process at certain times there are jets etc, i saw a picture of a timeline for R Aquarii but can not find it anymore, where they tracked outburst and jets in time. About 10, i do not think a nuclear reaction is needed, setting up an e-field and overload it with charge (photons) shoould be sufficient to initiate a spark (breakdown), that may resemble a z-pinch. So, is it true that double layers form birkeland filaments? I'm asking this question because it is a prediction of the Egyptian Book of the Dead in my own translation of it. Sithri wrote: So, is it true that double layers form birkeland filaments? I'm asking this question because it is a prediction of the Egyptian Book of the Dead in my own translation of it. Logically the reverse would be true. In experiments, the double layers are the result of a current through plasma, like a Birkeland current. The Egyptian Books are more related the the spiritual realm. Better do not mix them up. So, double layers do not twist to form birkeland filaments? Like two double layers meeting and then twisting upon each other? Birkeland filaments form z-pinches which form stars. Maybe my translation is a bit off, because there's one hieroglyph that I am not completely sure of its meaning. The closest I can get to it is 'waters (plasma) divided.' Maybe it means connected? The hieroglyph itself is water on the top with multiple lines slanting going down to a snubbed surface. The snubbed surface is hieroglyph Aa15 in Gardiner's Sign List and the water is N35. The Egyptian Book of the Dead is about the Stars and Zodiac and the holiness thereof. Ever seen the movie 'Stargate'? The Egyptians were known as MItsrayim, which is derived from the word Mazzaroth, which means Zodiac. So the Egyptians were literally 'people of the zodiac.' My translation uses Biblical Hebrew and Ancient Hebrew to derive Ancient Egyptian from it, which the Exodus, even if not occurring as the bible states with miracles, was a major mass-immigration of peoples from Egypt to Canaan. Ancient Egyptian became Ancient Hebrew, then Phoenician, and then Greek, which proves this. Sithri wrote: The closest I can get to it is 'waters (plasma) divided.' Maybe it means connected? If you look at the milky-way it looks like a cloud or even a river. So I think the sentence means that a cloud or river connect the stars. I don't think so. Primarily I use the Aa15 is used as a divisor while N35 is used as 'waters of outer space' or simply and vaguely, 'multitudes'. If I were to translate this as charge separation, it would work. However excuse my unfamiliarity with the EU as I don't know if charge separation would work in forming birkeland filaments, although it may be useful in forming a binary star. I'm trying to predict what would happen in a formation of a binary star, as I am translating the text and it should describe what happens in this instance without me having foreknowledge of the EU, which would taint my interpretation of the text. Do you think that any of you can give me the steps to the formation of a binary star in the EU? It most likely has charge separation or some kind of insulation of one star from the other which allows both to form as a binary system. This is what I am concerned about. but swirls around each other, once the pinch subsides i think the plasma matter will join to become 1 star. But i started the thread to find a physical explanation and ideas from other people, please keep myth out of this, maybe you can start a thread about that on NIAMI. "I propose that in a z-pinch, or star forming filament, only 1 star is born (per pinch)...."
"...[P]lasma experiments show that big objects (stars) are formed very efficiently in a cosmic lightning bolt in a dusty nebula — rather like bead lightning where the discharge pinches off to form a string of bright plasma spheres. Once formed, the stars “scatter like buckshot” and each star may fission to achieve electrical stability. This explains why about three quarters of stars have partners. That figure would be higher if we were to include gas giant partners. The ELECTRIC UNIVERSE® ‘starts with something big and breaks it into pieces.’ The fission process is repeated in further electrical disturbances by flaring red dwarfs and gas giant planets ejecting rocky and icy planets, moons, comets, asteroids and meteorites. Planetary systems may also be acquired over time by electrical capture of independent interstellar bodies such as dim brown dwarf stars. That seems the best explanation for our ‘fruit salad’ of a solar system. Capture of a brown dwarf requires that the dim star accommodate to a new electrical environment within the plasma sheath of the Sun. The brown dwarf flares and ejects matter, which becomes planets, moons and smaller debris. The ‘dead’ dwarf star becomes a gas giant planet. This is not the 4.5 billion year evolutionary story of the clockwork solar system taught to us in Astronomy I. There is no primordial nebular ‘stuff’ of which all objects in the solar system were formed at the one time. The ‘stuff’ of which stars are made has been differentiated and altered by plasma discharge processes. All stars produce heavy elements in their photospheric discharges, which alters their internal composition with time. And the ‘stuff’ expelled electrically from inside stars and gas giants is further modified elementally, chemically and isotopically. Meteorites bear witness to this process in their isotopic anomalies and the myriad tiny glass spheres found in most of them — attributed by more than one brave astronomer to ‘lightning’ in the solar nebula. The production of heavy radioactive elements in situ by ‘cosmic thunderbolts’ renders standard geological dating techniques useless for establishing ages. Other distinctions of the ELECTRIC UNIVERSE® model are so stark as to provide simple observational tests to eliminate one or the other model. Saturn’s moon, Enceladus, provides another opportunity." It's pretty obvious that binary stars are not single stars and do not collide with one another. Sirius is a pertinent example. I'm interested in how a binary star forms. That's good enough for this thread,right? It is called 'Star Birth'. In my own view, Stars do not form as binary stars by being 'scattered like buckshot' and then re-assembling into binary stars. I think that there has something to do with First it's two threads, then it gathers in dual multitudes of two threads each, then there's a separation, and then there's the intertwining (z-pinches?) that form the two stars. Is this correct in the EU understanding? It's pretty obvious that binary stars are not single stars and do not collide with one another. Sirius is a pertinent example. I'm interested in how a binary star forms. Yes, it is pretty obvious that stars, planets, moons and asteroids do not collide and then re-differentiate from the crash materials. You are interested in how a binary star system forms. Let me get that for you. The positively charged material within the star begins to offset from itself, then part of it is repelled, resulting in a companion star. As for the ubiquitous spherical objects: small spheres have been created in the lab by running electricity through various materials. So have craters with flat floors and central peaks. This is evidence that the fissioned moons covered with craters have been electrically scarred by the parent body, or by encounters with other bodies. Last edited by Brigit Bara on Mon Jan 28, 2019 2:22 pm, edited 1 time in total. You are interested in how a binary star forms. Let me get that for you. So basically binary stars form from ejecting another star from a larger one and then orbiting one another. Interesting. I was thinking that they form simultaneously with one another in two separated birkeland filaments that form twisting around one another, which in themselves are z-pinching their own stars, thus forming the spinning that a binary star would require as well as the 'feeding' circuits that keep a binary star alive. It wouldn't make sense that they begin spinning round one another if they were ejected from a star unless there were some kind electrical/magnetic/electromagnetic effect that bound them to one another yet provided the distance between the two needed to form the binary aspect of a binary star. 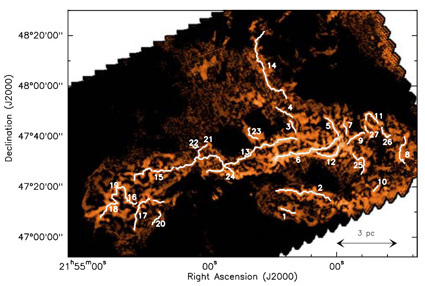 A network of 27 star forming filaments derived from Herschel observations of the IC 5146 molecular cloud. Credit: D. Arzoumanian et al. 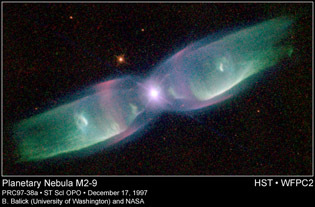 "This ‘planetary nebula’ shows a typical star’s co-axial circuit in a more active ‘glow mode.’ The electromagnetic plasma ‘pinch’ centered on the star is clearly evident."